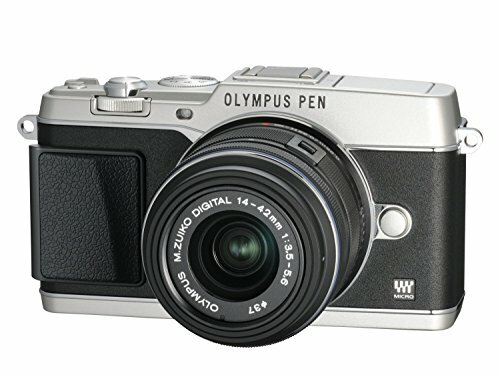 The price might be a bit of a hurdle, and there are some small niggles that hold it back from perfection, but otherwise the E-P5's combination of top notch build quality and equally top notch image quality make it not only the best Olympus Pen, it's one of the best compact system cameras yet. Subtlety of design has always been one of the distinctions between the Olympus Pen series and other compact system cameras. In the case of the E-P5, Olympus has put its name centre stage - quite literally, as the shiny "Olympus Pen" branding across the front of the camera attests. It's like a badge of honour, a proud statement that only confident brands can deliver. But the Pen E-P5 isn't just about its exterior quality. This interchangeable lens camera comes complete with the same sensor as found in the much-lauded OM-D E-M5, introduces Wi-Fi to the Pen series, while pro-spec features such as a 1/8000th sec maximum shutter speed give it extra pomp compared to much of the competition. But at a pound under £1,000 for the kit option the Olympus Pen E-P5 sure is pricey. Can it deliver substance in addition to style and elevate the already successful series to new heights? The black-finish E-P5 model that arrived at Pocket-lint Towers may not have the same striking character of the silver and white body options, but the metal body design delivers a premium feel in the hand. That's where a chunk of the price comes from - plenty of other Pen models now feature the OM-D's sensor and so it's in those finer details of build and layout that the E-P5 delivers something no other Pen model does. Two thumbwheels are at front and rear and sit well to the forefinger and thumb. We much prefer this kind of layout compared to a rotational d-pad dial, and while the E-P5 does have a d-pad to the rear it's strictly button-press only. Key to the layout is a new function switch - dubbed a "2x2 dial control" - that can be flicked between two positions to assign a second set of default controls to the two main thumbwheels. In aperture priority, for example, the typical layout gives aperture control on the rear thumbwheel and exposure sensitivity control on the front thumbwheel. Flick the switch and this rotates to white balance and ISO sensitivity adjustment, respectively. There are four modes available within the menus, the second of which switches dial direction, while the third and fourth allege to adjust AF and movie mode - but in our sample model these last two didn't take effect. We're a little baffled as to why the second position of the 2x2 dial doesn't offer fully customisable controls within the menus. Other controls - with the exception of one programmable function button to the top - are marked for specific use which, while it lacks the level of customisation compared to something such as the Panasonic Lumix GF6, isn't a major issue as the E-P5's centre OK button brings up a quick-access menu. From here it's possible to use the d-pad or the camera's touchscreen to select options as preferred. Previous Pen models lacked this hands-on control in menu areas, a small but positive progression on the E-P5's behalf. Elsewhere there's a hotshoe sitting to the side of the main mode dial. It now includes the latest "Accessory Port 2" terminal (AC2) to accommodate the new VF-4 electronic viewfinder. Adding one will increase the price by £249, but in terms of performance there are few electronic viewfinders better than the VF-4. We've been using the Olympus E-P5 for a week in a variety of conditions around Portland, Oregon, where sprawling cityscapes - not to mention the city's bizarre quirks - have presented challenging shooting conditions. But the E-P5 has carved through each situation with ease, whether in low light or bright sunlight. Its autofocus system is something else and certainly up there with the very best of compact system cameras' abilities. In single autofocus the only camera that comes close are the latest Panasonic G-series, like the Lumix G6. But it's not just the speed that makes it what it is. The rear LCD - which has a 1.04-million-dot resolution capacitive touchscreen - is the same quality as that found in the top-spec OM-D, albeit mounted on a tilt-angle bracket for waist-level or overhead work advantages. It maintains a decent preview image even in bright sunlight, which isn't something we can say about many cameras. The physical, hands-on approach to autofocus - where it's possible to press on the screen to focus or even fire the shutter - offers up a variety of AF area sizes as controlled by a slider to the right side of the screen. We like this user-based precision focus, but the touchscreen aspect may not suit all and it's easy to accidentally knock the screen into shooting when not expecting it. But it's not an essential method of control: turn the touch function off and there are 35 pre-defined focus points to select from arranged in a grid pattern across the majority of the centre-most area. The choice is yours, or use a combination of both. If there's one moan about autofocus, it's when switching over to continuous mode to track moving subjects. It's slowly improved from model to model throughout the Olympus range, but it's still not up to the standard of a good DSLR. Like so many compact system cameras this, for us, is pretty much the final hurdle to overcome. In dim light it's a struggle to follow any subject and maintain focus, while even in good light the focus can be unpredictable - swift to glide from one point to another one time, slow the next. There's not much hopping about, however, and none of the "pulsing" in and out of focus that he Sony NEX range can sometimes display. When using the E-P5 in quiet conditions there's an audible hum that comes from the 5-axis image stabilisation system. This isn't lens-dependent as the stabilisation system is a sensor-based solution that - while innovative in its ability to counter camera shake in a three-dimensional way - would be even better if silenced, although it's rarely noticeable in the real world. Other fine details get a thumbs up: there's a display on the rear screen that shows up the current focal length, but it's shown in absolute terms, not in the more typically understood 35mm equivalent. For that you'll just need to multiply by two in your head due to the sensor size. Even intricacies such as the physical on/off switch have a presence about them that's unlike most other cameras in this class and the aforementioned 1/8000th sec mechanical shutter is perfect for use with wide-open apertures in bright conditions. Top stuff. There's also a function button on the top of the camera that comes in handy - we've set it up to jump into manual focus, as there's no proper AF/MF switch on the camera body - something we think would have gone down well in the E-P5's design. When in manual focus there's a focus peaking function available which highlights in-focus areas in either black or white peaks. The screen chugs along at a lower frame rate and looks almost animated in this state though, and we're confused why there are no standout colours like blue to make a greater distinction of the focus peaks. It is an aid to manual focus, but compared to plenty of other manufacturers' more refined systems, the E-P5 feels a touch behind. Wi-Fi is all the rage in cameras of late. We've seen models from the Sony NEX-6, the Panasonic GF6 and all the way up to the hyper-connected Samsung Galaxy NX. But Olympus hasn't dipped its oar into the connected world before now. The E-P5 changes that. A common complaint of ours is that tapping in various codes and syncing camera to smart device is a lot of faff. The E-P5 attempts to simplify this by introducing a QR code scanner in the OI Share app. This gets the camera talking - whether to import shots, act as a remote control, add geotag data (there's no GPS in the E-P5) or edit shots - to the smart device. A great idea, but it's fundamentally flawed for certain devices. The HTC One's camera, for example, won't focus that close-up from within the Olympus app's confines, and so it gets stuck in a perpetual cycle of focus hunting and, ultimately, fails to function. As a back-up there's a password also shown on screen which you can put into the app, and used to connect instead. Great, in theory, but that doesn't work either, not on our HTC. The E-P5 Wi-Fi attempts to authenticate, then to connect, then jumps back to authenticate and gets stuck in a cycle until it eventually bombs out. Very tedious. When we tried the app with a back-up iPhone we were able to download the OI Share app but while the QR code was recognised, it still wouldn't connect. We reverted to the password connect option which was successful, but overall found the QR code method - despite its innovative concept - to be flawed. Once connected via Wi-Fi through the app, the remote control has its uses, but is limited to iAuto shooting only, not the more complex control offered by Panasonic. The best use is the "import photos" aspect of the app which quickly opens a thumbnail grid where individual images can be selected via a single press, before being saved. There's also an edit photo function which can be applied to any images - Olympus, camera phone or other camera - and offers 13 art filters, many of which can also be found in the E-P5's settings. That means dramatic tone, sepia, soft focus and plenty more besides. Olympus is late to the game with Wi-Fi connectivity and various issues hold it back from being truly useful, which is a shame, but we're sure things will improve over time. Even though the E-P5 uses a Micro Four Thirds sensor which is smaller than the APS-C sensors used in many DSLR and competitor compact system cameras, the resulting image quality stands up well. Really well. The ISO 200-25,000 range can be extended up to ISO 25,600 and even pushed the other way to a "faux" ISO 100 equivalent setting too. The latter may not have the full dynamic range of the standard settings but it's about time such a sensitivity was on board. The E-P5 handles image files with care: while the raw shots may not appear as sharp as JPEG files at the lower ISO sensitivities due to their neutrality, the presence of grain in raw files up to even ISO 1600 is of little impact to quality. If anything the presence of subtle grain maintains a better sharpness in raw files come this mid-high sensitivity level. It's right up there with the OM-D for quality that's for sure. Push the ISO sensitivity right up the scale and there is obviously image noise to take into consideration - it's a little more than a larger-sensor competitor, but not by miles. Above ISO 6400 and the top sensitivities are more about numbers than quality and are best avoided. Overall though the image quality straight out of the E-P5 is top notch. Considering the size of the sensor compared to its larger rivals, Olympus has performed some magic with this slice of Micro Four Thirds silicon. Big price equates to big things: the E-P5 is one of the best compact system cameras we've yet tested. But it's not quite perfection. Most of our criticism is small, but Wi-Fi is glitchy on some smart devices and doesn't offer as many options or as much control as we'd like, while we'd like more customisation and improved continuous autofocus in order to see the E-P5 push to that next level. Otherwise there's a huge amount to like: the E-P5's autofocus system is fast and capable in all kinds of light, image quality is great and we're fans of the new 2x2 dial control. The build quality is luxurious and that 1/8000th sec maxium shutter speed pushes into pro territory. It's a long list of positives. Substance and style meld into one excellent camera. If you're after a compact system camera without a built-in viewfinder then the E-P5 is as good as they come. If a viewfinder is essential then the VF-4 accessory is great, but it might make better financial sense to buy an OM-D E-M5 instead.